So recently I picked up a usb-based magic box from Focusrite called Scarlett 18i8 that lets you record several channels of audio into your computer as well as midi in/out and so forth. Pretty standard stuff these days, so nothing amazing to report there. The reason for buying it is my PC doesn’t actually have a sound card (or a video card built-in, either, for that matter). I’ve always been fascinated with the ‘music tracker’ style of writing, playing and generally larking about with music. Born out of the Amiga days in the 80s and going on to power the music behind some classic games such as Jazz Jackrabbit and Unreal Tournament, trackers are synonomous with the demo scene. One of the reasons for buying a USB sound card is that I wanted to use my PC for LAN gaming (which is pretty bad without sound!) and my case is Mini-ITX so I’ve basically got no slots left. It’s also an Intel server mobo so there is no sound card. Which leaves an external USB box basically my only choice. Good thing it works quite well, although it didn’t like Windows 10 preview very much. So there is a tip, don’t try and use the Focusrite Scarlett on Windows 10 preview because recording is somewhat broken. Works fine on Windows Server 2012, however. So I’m sticking to that for the moment. Gory details: Steam and games work just fine on a server mobo, ultra-low-power 17 watt Xeon CPU, ECC RAM (just ‘cos) and Windows Server 2012 OS. Who would’ve thought?!!? Enough about games, now this is where Renoise comes in. It’s not only a modern DAW (Digital Audio Workstation) but it also has the familiar tracker-based user interface. With all the effects you would expect to find in a tracker to pitch bend and delay notes. It actually makes a lot of sense, although it feels like you are using Microsoft Excel to write songs. Think about it, each column is a different instrument. So you can easily identify what instrument is playing what sample. This is not 100% true as you can mix and match instruments between columns (or tracks) but you should probably stick to the 1:1 rule just for clarity. I guess it’s up to you. Each row represents a pulse. If you want to write something in 4⁄4 (and that’s most people as it is hard to dance to anything with more beats per bar and the waltz is not so popular anymore… plus 2⁄4 is plain boring) then every 4th row, being the beat, will be highlighted. You write the rhythm track down, bass, melody, whatever in different columns and then set a BPM, and also a pattern length. Patterns are quite powerful. By default you have 64 beats in a pattern, which means 16 bars in a pattern (16 bars times 4 beats equals 64 pulses or rows - easy!). You then build up a small collection of patterns and then play them in a certain order, repeating patterns when it makes sense. In fact, each pattern can have a different length so that you can write bridges and codas and stuff like that. Now coming back to the spreadsheet thing, it does feel a little unnatural and of course everything is playing absolutely on the beat without fail. You can then “humanise” things or add a delay to each note and also do triplets and the like, but I guess the spreadsheet doesn’t really display this visually all that well, so it just has another column to tell you what the delay is. IN HEX. Oh boy, this is definitely one for the coders out there. So Renoise 3.0. It’s actually a really good product. I originally bought it because I figured I needed some way to record and write music and why not use a tracker-style interface. It has MIDI. Which works really well as a sampler because you can sample practically anything and then play it through your midi-enabled keyboard. The sampler has a few neat tricks such as effects chains and options to add looping to make your samples sustain for longer. The other thing it supports is ASIO, which is basically the only way I could get my USB recording device to actually record without crapping out with unsynchronised frequencies and bitrates. Actually I’m more accustomed to using Audacity but since it didn’t support ASIO, then Renoise 3.0 is my choice of app for recording anything, even things that aren’t really “samples” to be used in songs. What I haven’t yet done is master Renoise to the point where I can actually confidently say I have a brilliant song that I’d like to show people. Sure I can rip a bit off here and there and put in a half-decent rhythm channel. But actually making it sound GOOD is a LOT harder than I had expected. I used to write “music” years ago in Cakewalk using basic GM patches on a SoundBlaster AWE32 (which was pretty cool at the time with it’s SoundFont and SIMM memory slots on the soundcard itself). I have rather high hopes of getting something together that’s quite a lot like the songs on my Disco Track of the Week page, which, incidently has been renamed to Laser Soul Track of the Week (cue super-bogan Laser Soul anti-hero voice). The songs are actually fairly simple in structure. C-major, quite a rigid structure of intro-verse-chorus-verse-chorus-breakdown-solo-chorus (or something like that). I even got to the point of mapping out a full song into Excel (woo spreadsheets) to work out what kinds of patterns I would require to make the song. So that leaves me with a lot of effort remaining to get some sort of song up to scratch. And back to Renoise 3.0. It’s actually pretty good and not very expensive and it does the job well. It also runs fast and can be installed on multiple PCs using the one licence, so I can move from my desktop to my laptop without having to worry about licences. Updates are pretty lean on the ground, but it all seems to hang together so maybe they aren’t required? So that’s it. 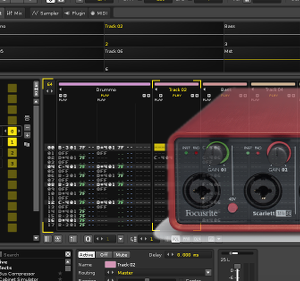 A decent combo is the Focusrite Scarlett 18i8 and Renoise 3.0 on Windows (pre-version 10). I haven’t tried it on a Mac, so who knows what it would do there but I assume it would work.